Years ago I came across an angling author, whose name I have long forgotten, who was making models of insects (wings, legs and all) out of moulded plastic. His idea, if I remember correctly, was that they would be more realistic imitations of the natural creatures for use in fly fishing than creations of fur, feathers and tinsel. He may or may not have been correct but one thing is certain, a lot of fly dressers (and there are many) and fly fishermen (and there are even more) were inclined to frown on his little venture. Anyway, the idea never really caught on. These days I think the idea that the fly fishing involves 'exactly imitating natural insects' has long since died the death. Fly tackle is designed to cast a more or less weightless fly or lure to the fish without the need for floats, weights or controllers other than the actual rod and line itself. The nature of what's at the business end is very flexible. Of course there are still places where you are only allowed to use the 'dry fly' or, in very special circumstances, 'the upstream nymph' to catch trout. However, with so many well established still water trout fisheries and the explosion of 'drys, spiders, winged flies, parachutes, CDCs,klinkhammers, daddies, mayflies, dappers, wets, nymphs, damsels, muddlers, coneheads, bombers, tubes, doubles, trebles, waddingtons,lures, shrimps, buzzers, bugs and grubs; no one surely still thinks that flies are meant to represent insects nor indeed that every imitation must be constructed from some sort of fluff - either natural or synthetic. Now fly tying can be a very satisfying and therapeutic activity. Some of my best fishing pals enjoy tying their own flies and they are often very good anglers as well. Certainly most of them are much more adept at casting a fly than I am (not difficult to achieve). Of course for those of us who venture into saltwater with fly gear, insect imitations are generally pointless. Only in a very few cases do sea fish take 'flies' - this is mainly because there are hardly any marine insects. Apart from seaweed flies, saltmarsh midges and the occasional fall of flying ants, sea fish have to feed on aquatic animals such as fish, squid, shrimps and crabs so these are the beasts SWOFFERs have to copy. Many modern salt water fly fishers learned their trade on lakes and rivers so, naturally, they tend to use the 'flies' that they are familiar with. They are usually unashamed imitations of small fish, so popular flies such as Clousers, Deceivers and fry flies all made the transition to or were developed in salty water, often very successfully. Many of these creations are made from synthetic yarns and flashing tinsel as well as the more traditional animal fur and feather but without lots of rod wiggling and stripping it's difficult to impart much life to lures like these. Most of these flies incorporate a bit of plastic such as the resin or Bug Bond heads and finishes that stop them falling apart or add a bit of weight. 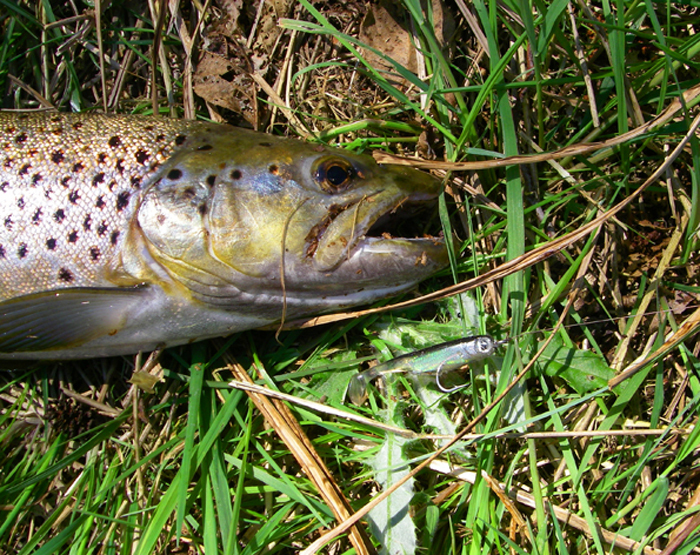 In complete contrast to traditional fly fishing, sea angling with lures generally involves waggy or wriggly lures made from metals, hard plastic plugs or soft plastic eels. The latter types, in particular, can easily be reduced in size to enable them to be cast on fly tackle. For years now I have been fly fishing for pollack, mackerel, bass and scad with tiny 'Redgill' or 'Delta' type eels with built in waggy tails. To me they seem much more lifelike than almost any fur or feather construction. I'm always on the lookout for new and 'better' plastic flies and the recent Light Rock Fishing craze with its plethora of little plastic attractors seems (to me) likely to be a godsend to the salt water fly fisher. 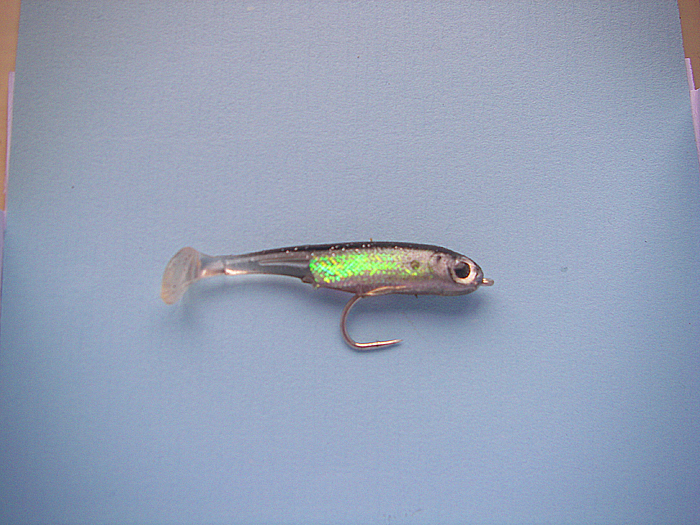 I recently came across some tiny lures made by Berkley called 'Powerbait 2" Gotam shads'. To me they look exactly like many small marine baitfish - sprats, pilchards, herrings, sandsmelts and a whole host of silvery tropical baitfishes and, as a bonus, they have a built in paddletail that makes them wriggle like mad. Fantastic. Today I decided to 'try out' my new 'shad-flies' in the local millstream. It's currently low and clear and so I thought it would be easy to see exactly what the lures were doing. I fitted one of the shads up with a stainless fly hook, tied it onto a length of six pound nylon and set out. The fly looked as good as I hoped, with lots of flash and a built in vibration, and on about my tenth cast (not really a cast to be honest - I just trailed the line in the white water downstream of a small weir) it was taken by a nice trout. 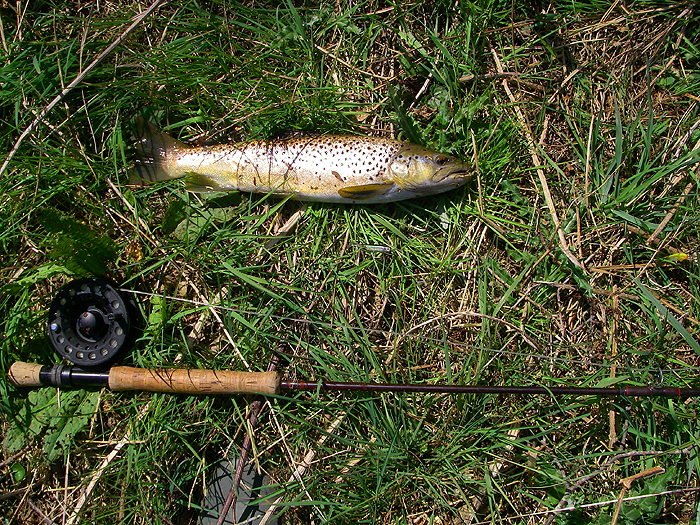 After I'd taken a picture I returned the trout and packed in - well satisfied. I can't honestly say that the trout fought as well as a mackerel or indeed most of the other similar-sized seafish that I regularly catch on the same rod, reel and line but it showed that the lure is attractive to predatory fish. I can't wait to dangle it in the briney.